As a spearfisher you will find a lot of fins to choose from. Choosing the best spearfishing fins is important, as fins are part of the basic equipment for spearfishing (along with diving mask and snorkel). This guide will help you choose the best spearfishing fins. Note that the fins guide below is for spearfishing without tanks. In this guide you will learn the most important factors you should take into account before you buy a pair of fins for spearfishing. What type of fins should I go for? When you are looking for the best fins for spearfishing you basically have one choice, the so-called long fins (also called bi-fins or stereo fins). Choose fins that are long and soft. Choose a fin without a heel strap. Decide if you want an angle between footpockets and fin blade. The size of your fin should be a few numbers greater than your shoe size. Select the material that meets your demands – see table below. As a spearfisher you always want long fins, as these give the most progress when you are swimming. Soft fins will give you the most comfort. As a spearfisher you will usually be in the water for some time. 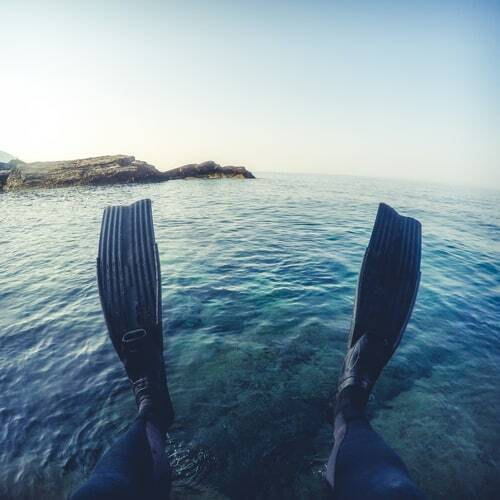 Rigid fins can become increasingly uncomfortable for your ankles when you have worn them for a while. Soft fins, on the other hand, you can wear for hours without any problem. If you are new at spearfishing – practice makes perfect, and the more hours you are in the water the more fish you have the opportunity to catch! Therefore, it is important that everything feel comfortable when you are in the water. Performance-wise, there is little difference between the soft and rigid fins. How do you know if the fins are soft? Here is a trick you can use to see if the fins you are about to purchase are soft. Hold fins against each other. The softest fin blade will give in – and these are the ones and the ones you should purchase. Some people will tell you that it’s good to have rigid fins to spearfish in deep water. It’s a myth! Spearfishing usually takes place at a maximum depth of 40 meters, and at this depth is no problem to wear soft fins if you are properly balanced (see our post on weights). I have been diving to about 48 meters with my Captain Nemo fins (stiffness number 2 of 5) – without any problems. But usually I will stick to 40 meters when I’m underwater hunting. If you are diving no more than about 40 meters the soft fins will be completely fine. The reason you should avoid an open heel is that this type of fins has poorer transmission of power from the leg to the fin blade. The angle between footpockets and fin blade makes a difference when you are swimming on the surface. If you have an angle of about 20 degrees on your fins they will be in a more vertical position when you are swimming on the surface. This means that you do not have to kick as much with your legs to get momentum, which will save you energy. I also you will be splashing less water around (which means you do not scare the fish away). As a spearfisher you will normally do a lot of swimming on the surface swimming, and the less energy you have to use on this will be beneficial. If I should buy a pair of new fins now, I would consider a pair with an angle. When you are spearfishing you will often wear your fins for many hours at a time. Combine this with fins without a heel strap and you have yourself a good old chafe. Therefore – use neoprene socks. Buy your fins a few sizes bigger than your shoe size. This way you will have room for a neoprene sock and avoid annoying chafes. Over time, a pair of plastic fins will become less elastic and therefore less efficient when you are swimming. Typically this happens within a year’s time. Fins with fiberglass blades are almost impossible to destroy. I have had my Waterway Captain Nemos more than 5 years now – and have not been particularly good on them. Nevertheless – they are still functioning like they should. For a long time fins made of carbon have been very fragile. If you dropped them on a rock they would splinter. If your buddy was standing on them and you attempted to pull them out (which can happen on a diving boat), they would break. The quality has improved quite a bit in recent years, but there are still some very fragile fins on the market. If you choose carbon fiber fins, it is a good idea to choose a model that has been on the market for some years and therefore have been tested by a lot of users. The long bi-fins typically have a fin blade of 60-70cm. If you are not used to swimming with fins this can be a challenge. Which swim technique should I use? You can swim both crawl and butterfly when using long fins. I prefer to swim crawl, if I am swimming for longer periods. But some find it nice to switch between the two disciplines, as this is a way to use different muscle groups. Your kick is coming from the hip. You knees are not bent when you kick downward. Do not make 8-shaped movements! Your fins should not be moved in eights when you are swimming. The easiest way to think of it is that you should be moving your big toe straight and not be “losing” your ankle inward. An alternative is to think “robot legs.” Think of yourself as not being able to move your knees and keep a straight ankle. Due to water resistance, this will make you bend your knees a bit when you are kicking, but the kick itself will come from the hip. If I should choose a pair of long fins, I would choose a pair of fiberglass fins from Captain Nemo. I’ve had them for more than 5 years and dived with them several hundred hours. I’ve caught many fish and participated in a lot of competitions wearing these fins and it’s almost impossible to wear them out, despite the fact that I have NOT been very gentle with them. If you are you on a budget then soft plastic fins act as a cheaper alternative. After a few years (2-3 years) plastic fins will wear out. 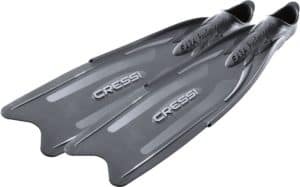 Soft plastic fins are a good alternative if you are just getting started with spearfishing and don’t want to spend a lot of money upfront before you know if this sport is for you.